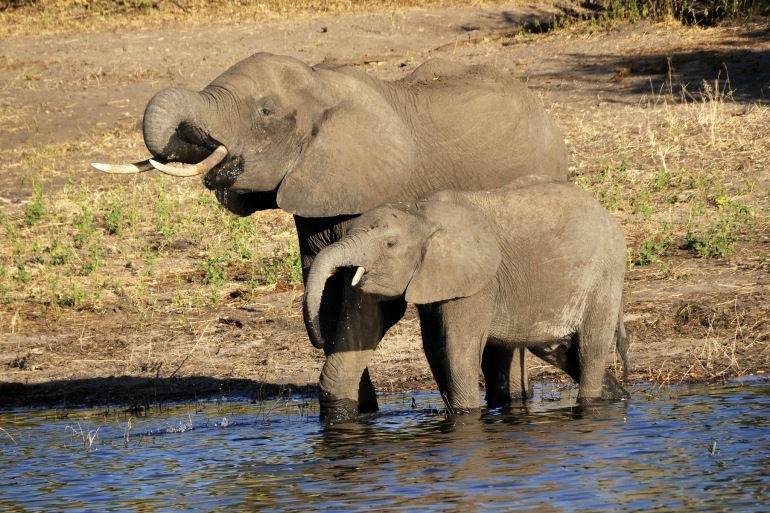 Cruise the Chobe River to delight in the park's large herds of elephant that concentrate in and by the Chobe River particularly during dry season, accompanied by other wildlife. Then to Maun for a mokoro safari in the Okavango Delta, a vast wetland teeming with animals and birdlife. No reviews yet for this trip. Browse other reviews below for Absolute Africa. Professional tour leader and drivers. Will recommend the 33 day Nairobi to Johannesburg. Truly fantastic experience traveling through East Africa on the Wildlife and Spice Island (1 June dep. ) with the Absolute Africa team. The truck crew of Steve our driver and Aly our tour leader were awesome, and really made the trip for me. I haven't stopped raving about the trip and company since I got home, and am already plotting my next adventure in Africa with Absolute. Had the most awesome 60th Birthday ever, got to see all the big 5. The truck and the crew, Peter our driver, John the chef, and Tour leaders Mafaro and Nash were brilliant. Thank you all so much. And a big thanks to my fellow passengers who were a great bunch. Did the Kenya and Tanzania on Jan 20th. Amazing trip! Great value, great people great route. I would recommend Absolute Africa to anyone! After much researching we chose absolute Africa as they were the cheapest. From their website you will see that there is an emphasis put on teamwork etc, something what we were looking forward to. As it turned out the owner "taxi Dave" entered into a deal with a group on the trip. This group paid a minimal fee and did absolutely nothing, didn't set up their tents, didn't take part in cooking all for a minimal fee, 1 pound a day. Not bad!! Ourselves and another couple who were on the trip were never told about this extra deal so when we saw this group doing nothing there was an unease within the whole group. We took the northern star route. Also you need to be carefull as the itinerary doesn't give you a true reflection of game park entry's and we had to pay into 2 game parks that were suppose to be included in our fee (got a fluffy explain action when we asked the owner). The itinerary says that you go to 7 countries, realistically you only see 3/4 and the other countries are just in transit and to top it all off, the last country, Kenya, they put you on a shuttle bus (nothing to do with absolute Africa) in Tanzania and let you go through the border on your own. Further when we emailed the boss "taxi Dave" he was extremely unhelpful and rude. Have some good memories but sour taste left, particularly with the ignorant owner. If going again, would definitely go with a different company. This morning we leave at 7 AM in customised open safari vehicles to travel to the mokoro mooring station about an hour away. With a little luck we might see wildlife on our drive in. Arriving at the station we meet our traditional polers. From here we head out early into the Okavango Delta for three days to travel through the serene waterways of the Delta in a mokoro poled by the traditional Botswanan polers. We drift through the narrow reed lined channels and stop off on islands where we set up camp and have lunch surrounded by the sights and sounds of the African bush. This afternoon we have a guided bush walk before returning to sit beside a roaring crackling campfire and enjoy the African night sky full of stars – our bush TV! Today we go on an early morning game walk. Then there is time to go fishing, learn how to steer a mokoro, or sit back and enjoy this unique environment. The guides will also take you to a safe location to swim if you wish this afternoon, before we return to camp late afternoon for dinner. hotel and a final night with traditional singing and dancing. A transfer to Maun airport for your onward flight is included in the price of your trip. We believe that your safety and enjoyment when travelling overseas with us is very important which is why we recommend arranging cover with specialist insurance brokers Campbell Irvine Direct. Campbell Irvine have over 35 years experience in adventure travel insurance. It is a condition of booking that you have travel insurance in place to cover your entire trip. You are responsible to ensure your policy is adequate for your travel plans even if we have seen your policy. Not all insurance policies are the same. When travelling overland in Africa you want to be sure you have appropriate cover given the adventurous nature of what you are doing. Make sure you have adequate accident and medical cover including cover for repatriation home in the event you became ill and couldn't continue, and also that all the adventure activities you may want to do are covered. If you need cover for one way travel do also check the policy does cover this when obtaining a quote. Activities like safari walks, white water rafting on grade 5 rapids, bungee jumping, horse riding and trekking Kilimanjaro are not necessarily covered by all policies - so check out the small print carefully. Take a look at our overland adventure travel insurance! Overland adventure travel is covered and arranging cover on line is quick & super easy to arrange. 24-Hour Worldwide Emergency Medical Service with Global Response who are experts in providing friendly and professional emergency help. 14 day money back cooling off period. A pre-departure medical screen helpline. An extensive list of activities covered on your trip. Easy to purchase Add Ons for activities not covered by the standard premiums such as sky diving and quad biking. Whilst travelling with Absolute Africa we aim to allow you to experience new people and places, whilst respecting and preserving the cultural integrity of the people and the natural state of the environments we visit. Litter: When packing, bear in mind that relatively little commercial recycling is done in Africa. Where possible remove packaging before you go to Africa and use biodegradable products. Whilst on the road, retain your litter until you reach a town or city where it can be disposed of safely. Water may seem plentiful at the time you are travelling on your overland trip, however many people in Africa are totally reliant on seasonal surface water that is within walking distance. They share this limited resource with both their domestic livestock and the wildlife for which Africa is famous. With this is mind, we promote conservative water usage and support the use of environmentally friendly cleaning products. Shopping: Wherever possible we support the economies of the many rural areas through which we travel. We encourage our clients to purchase local food for their lunches and we also encourage visiting in villages where souvenirs can be purchased directly from the craftsmen or women. Purchase of products produced from endangered and/or protected fauna and flora is discouraged. Many people in Africa are reliant on woodfires for cooking. As the population has increased the impact of this is of growing concern. Whilst barbeques are an integral part of any African experience, we frequently utilize gas cookers in order to help preserve the increasingly scarce wood supply. Consideration should be taken of the customs and beliefs of the people you meet on your travels. Some cultures have beliefs regarding having their photograph taken, so it is polite to ask permission first. Attitudes with regards to clothing are often quite conservative, so your dress code should take this into consideration. To ensure that you dont offend, revealing garments like g-string bikinis should be avoided. Religious beliefs and events should always be respected. Trying to understand the customs and beliefs of the people you meet will enhance your travel experience and broaden your perspective. You may pass through some fragile and unique ecosystems that deserve particular respect. Some immensely important concerns, such as the preservation of endangered animals like the mountain gorillas are obvious. Less obvious perhaps is the preservation of all habitats as they support a myriad of species, as is the preservation of lesser known species of fauna and flora. Take care where you walk . Stick to established paths, and leave things as beautiful and untouched as you find them.